Vanderbilt research by Amanda R. Carrico, Micajah Spoden, Kenneth A. Wallston & Michael P. Vandenbergh suggests washing your hands with hot water does not kill more germs than cold water. The paper, "The Environmental Cost of Misinformation: Why the Recommendation to Use Warm Water for Handwashing is Problematic," was also cited in National Geographic . Policy experts have proposed numerous approaches to mitigating climate change, from federal carbon taxes and power plant regulations to international agreements. Although many experts assume that climate change policy must come from government entities, our interdisciplinary research team has focused on an important development that has received less attention: the increase in climate mitigation efforts by private organizations. This private sector climate action entails private corporations acting alone and with other private organizations to perform the traditional government function of reducing a threat to the environment. Steve Chriss, Wal-Mart Stores, Inc. The panel was moderated by Professor Michael Vandenbergh. A tool for better member volunteer matching - December 16, 2015 - Getting the right members into the right volunteer roles is a constant challenge for associations, and poor fit is a major drag on efficiency. A “volunteer interest typology” developed by a pair of social science researchers may offer some help. Alexander Maki, Ph.D., postdoctoral fellow at Vanderbilt's Institute for Energy and the Environment is coauthor of the study and is quoted. Roll Call: Opinion: Obama’s Clean Power Plan: Let’s listen to experts, learn from experience - June 1, 2015 - It’s always helpful to look at what independent scholars have to say before analyzing the president’s Clean Power Plan, writes Rep. Steve Cohen, mentioning a recent conference at Vanderbilt Law School hosted by the Energy, Environment and Land Use Program. On May 18-19, policymakers, scholars and practitioners from several disciplines explored different perspectives on the health, energy demand and economic effects of the EPA's developing Clean Power Plan. The Washington Post: The next energy revolution won’t be in wind or solar. It will be in our brains - The Department of Defense is the single biggest user of energy in the United States. Through behavioral changes alone, the military would stand at the forefront of an energy revolution that may someday rival wind or solar in importance. A study about U.S. carbon emissions being affected by household behavioral change conducted by Michael Vandenbergh, director of the Vanderbilt Law School’s Climate Change Research Network, Kenneth Wallston, associate professor of nursing, and alumni Amanda Carrico and Paul Padgett is cited. 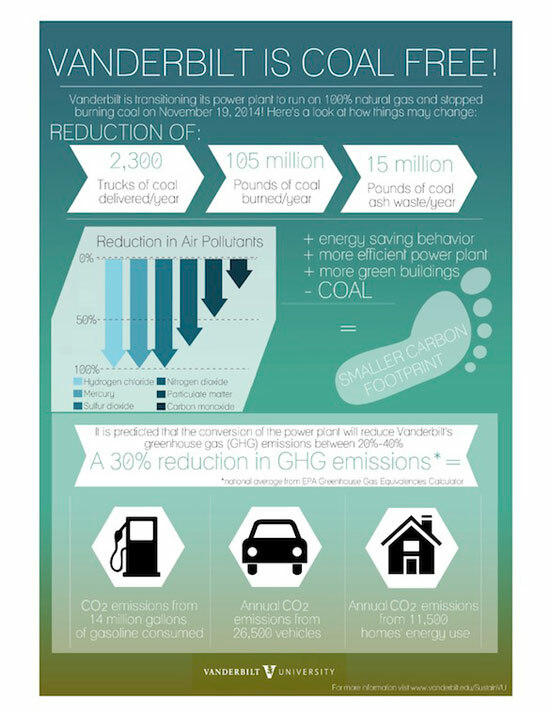 Vanderbilt power plant is now coal-FREE! Who is responsible for climate change? The question of responsibility for climate change lies at the heart of debate over actions to address it. This symposium, featuring Professor Michael Vandenbergh, explores the conceptual territory of climate responsibility, and scientiﬁc, legal, ethical, and policy bases for assigning responsibility to countries and to other entities—from individuals to emitting industries to the fossil fuel companies at the base of the carbon supply chain whose responsibilities are now being actively debated in shareholder resolutions and calls for institutional divestment. Other speakers include: Peter C. Frumhoff, Union of Concerned Scientists; Michael B. Gerrard, Columbia Law School; Karenna Gore, Union Theological Seminary; Sivan Kartha, Stockholm Environment Institute; and Naomi Oreskes, Harvard University. Washington Post: We could keep a huge amount of carbon out of the atmosphere just by changing people’s behavior - March 2, 2015 - A new EPA rule established to incentivize people to make more energy-efficient choices could reduce emissions a lot more than the agency estimates, according to research coauthored by Michael Vandenbergh, David Daniels Allen Distinguished Professor of Law and director of the Climate Change Research Network. The Washington Post: The next energy revolution won’t be in wind or solar. It will be in our brains. The Department of Defense is the single biggest user of energy in the United States. Through behavioral changes alone, the military would stand at the forefront of an energy revolution that may someday rival wind or solar in importance. A study about U.S. carbon emissions being affected by household behavioral change conducted by Michael Vandenbergh, director of the Vanderbilt Law School’s Climate Change Research Network, Kenneth Wallston, associate professor of nursing, and alumni Amanda Carrico and Paul Padgett is cited. Scientific American: Brrrrrr – it’s cold outside! Taking a look at winter car idling - January 26, 2015 - Idling of cars costs money, consumes energy, and pollutes the air. But, when winter temperatures dip below freezing, many Americans intentionally idle their cars for long periods of time. The story mentions research into the impact of car idling by Michael Vandenbergh, director of the Vanderbilt Law School’s Climate Change Research Network, Jonathan Gilligan, associate professor of Earth and environmental sciences, Kenneth Wallston, associate professor of nursing, and alumni Amanda Carrico and Paul Padgett. Washington Post: The biggest winter energy myth: That you need to idle your car before driving - January 6, 2015 - Letting a car warm up in winter made sense when cars had carburetors, but modern cars have no such need. A study calculating the consequences of idling by Michael Vandenbergh, Tarkington Chair in Teaching Excellence, professor of law and director of the Vanderbilt Law School’s Climate Change Research Network, Kenneth Wallston, associate professor of nursing, and alumni Amanda Carrico and Paul Padgett is cited. Washington Post: Why is it hard to get anywhere on fracking? Because people are too full of themselves. In a new study just out in the Journal of Environmental Psychology, Kaitlin Toner Raimi, postdoctoral fellow at the Vanderbilt Institute for Energy and Environment, shows that on both sides of the fracking debate, those with more extreme views (either in favor of fracking, or against it) have a higher level of “belief superiority,” meaning that they think their views are more “correct” than the views held by other people. Politico: Superiority complex - December 17, 2013 - Part of the problem with politics today may be that increasingly politicians who feel superior about their own viewpoints are elected, writes Kaitlin Toner, a postdoctoral research fellow at the Vanderbilt Institute for Energy and Environment and Climate Change Research Network. A recent study conducted by Toner with colleagues at Duke University suggests that "belief superiority"—the belief that one's own viewpoints are notably more correct than other people's—is tied to political extremism. Futurity: Wash your hands! But turn down the heat - December 11, 2013 - Washing hands in hot water offers no more hygienic benefits than using room temperature water—and significantly adds to greenhouse gas emissions worldwide. Amanda Carrico, research assistant professor at the Institute for Energy and Environment at Vanderbilt University, is quoted. Carrico is also quoted in Third Age: Tepid water for washing hands is fine. "Implementing Climate Change Policy: Looking Forward to the Hard Part" - Washington D.C.
January 30, 2014 - Michael Vandenbergh, professor of law and director of the Climate Change Research Network, was a guest on NewsChannel 5's "Open Line" for a wide-ranging interview on climate change. Assessing and Communicating Climate Science: A Climate Prediction Market - November 15, 2013 - Featuring a talk by Professor Michael Vandenbergh. "Cooler, Smarter: Practical Steps for Low-Carbon Living," a talk by co-author, David Friedman, deputy director for the Union of Concerned Scientist's Clean Vehicles Program - May 17, 2012 at 12:00 p.m., 123 Buttrick Hall (brown bag). Co-sponsored by the Vanderbilt Climate Change Research Network and the American Studies Sustainability Project. Andrea George, VU Sustainability, "Vanderbilt's recently-completed greenhouse gas emissions inventory. Read the full report HERE. WPLN: Global warming to stress Tennessee: Vandy, ORNL experts - September 11, 2012 - By the year 2050, Tennessee will be three to five degrees hotter on average, according to a new report by experts from Vanderbilt University and Oak Ridge National Lab, that draws on a raft of government data and academic journals. Researchers say the issues of water and disease could increase stress on social and civic systems. Jonathan Gilligan, associate professor of earth and environmental sciences, is quoted. The Vanderbilt Institute for Energy and Environment is cited as a sponsor of the report. School announces new department chair, 3 faculty appointments - August 22, 2012 - The School of Engineering has announced the appointments of a new department chair, George M. Hornberger, and three new faculty members; Rizia Bardhan, Ravindra Duddu and Cary Pint. The Tennessean: Priest Lake levels dip to lowest ever for spring - May 10, 2012 - The warm, dry spring has taken its toll on the Cumberland River Basin. The low water levels could cause problems for power generation, water treatment and river navigation, experts said Wednesday. It also could harm fish and means boaters this summer should be on the lookout for hazards. George Hornberger, University Distinguished Professor of Civil and Environmental Engineering and Earth and Environmental Sciences, is quoted. New York Times: Reversing years of neglect on a hill above Nashville - May 8, 2012 - On a bluff overlooking the Cumberland River, the odd collection of trolley barns and old hospital buildings here known as Rolling Mill Hill has been in some stage of redevelopment for the last 14 years. The recession nearly halted work on the 34-acre site, which has been promoted as a mixed-use community for Nashville's creative class and a revival of a once-neglected section of this city of 600,000. Now, activity is humming again at Rolling Mill Hill. James Fraser, associate professor of human and organizational development and expert in urban revitalization and public policy, is quoted. School announces new department chair, 3 faculty appointments - August 22, 2012 - The School of Engineering has announced the appointments of a new department chair, George M. Hornberger , and three new faculty members;Rizia Bardhan, Ravindra Duddu and Cary Pint. The Tennessean: Priest Lake levels dip to lowest ever for spring - May 10, 2012 - The warm, dry spring has taken its toll on the Cumberland River Basin. The low water levels could cause problems for power generation, water treatment and river navigation, experts said Wednesday. It also could harm fish and means boaters this summer should be on the lookout for hazards. George M. Hornberger , University Distinguished Professor of Civil and Environmental Engineering and Earth and Environmental Sciences, is quoted. January 31, 2012 - In the latest example of how the work of VIEE is being used in policymaking, a paper published in 2009 by Carrico et al., Costly Myths: An analysis of idling beliefs and behavior in personal motor vehicles , has been cited by the Toronto Board of Public Health in a recent report . The report served as the basis for reforming Toronto's anti-idling bylaw in 2010; it sets a limit of one minute of idling per 60 minutes, compared to three minutes of idling per 60 minutes in the 1998 bylaw. Tennessean : Phil Valentine's film attacks Al Gore, global warming claims - January 29, 2012 - Phil Valentine, a radio talk show personality who for years has derided Al Gore and concerns about global warming, has taken his crusade to the big screen with a new movie, An Inconsistent Truth. Professor of Law Michael Vandenbergh and Jonathan Gilligan, associate professor of earth and environmental sciences, are quoted. Several of the movie's scenes were filmed around Nashville, including some at Vanderbilt. The Tennessean: Cold will make comeback after Nashville's winter warm-up - January 25, 2012 - Although this winter seems unusually warm, it hasn't set any records and isn't necessarily a symptom of global climate change. Local temperature fluctuations are not good indicators of climate change, which is tracked using much larger trends, says Jonathan Gilligan, associate professor of earth and environmental sciences. The Tennessean: Power plants put strain on TN's freshwater rivers - November 16, 2011 - Electricity-generating power plants in Tennessee and elsewhere put a burden on freshwater rivers, streams and underground waters that could only grow worse as droughts hit and populations increase, according to a report released Tuesday. George Hornberger, director of Vanderbilt's Institute for Energy and the Environment and scientific advisory committee member for the report, is quoted. The Tennessean: Al Gore's message about climate change grows in urgency - September 7, 2011 - Former Vice President Al Gore has shifted from rallying support to pass legislation to try to stem climate change � an effort that resulted in a near miss in Congress � to an emphasis again on reaching everyday people. Michael Vandenbergh, a professor of law and director of the Climate Change Research Network, is quoted. R&D Magazine: The energy debate: coal vs. nuclear - June 13, 2011 - As America struggles down the road toward a coherent energy policy that focuses on a higher degree of self-reliance, policymakers face numerous issues and realities. Research conducted by Heather Barnes Truelove, a postdoctoral fellow in Civil and Environmental Engineering, is highlighted. climate.bna: Vanderbilt University law professor touts benefits of carbon labeling - May 9, 2011 - Michael Vandenbergh, director of the environmental law program at Vanderbilt, discusses how carbon labeling can help companies save costs and consumers reduce greenhouse gas emissions. The video interview was conducted at VUStar, Vanderbilt's campus broadcast facility. Washington Post: What's in a carbon footprint? Depends. - April 21, 2011 - Two years after being introduced, and handicapped by uncertainties about how to calculate those ratings, carbon-footprinting schemes struggle to be recognized as the standard stamps of eco-consciousness that the FairTrade, Energy Star and LEED systems have become. Michael Vandendbergh, Tarkington Chair in Teaching Excellence at Vanderbilt Law School and director of the Climate Change Research Network, is quoted. CNN: Will Earth day be overshadowed by another environmental disaster? - April 4, 2011 - A year ago, the worst environmental disaster in U.S. history�the Deepwater Horizon oil spill�began on Earth Day. This year, Japan is coping with the meltdown of the Fukushima nuclear plant, which could become that country's worst environmental disaster to date. Michael Vandenbergh, director of the Climate Change Research Network and Tarkington Chair in Teaching Excellence at Vanderbilt Law School, is quoted. March 30, 2011 - Michael Vandenbergh and colleagues Thomas Dietz and Paul Stern advocate private carbon labeling for products in inaugural issue of Nature Climate Change. Their research was mentioned in the United Press International. "Is Global Warming on the Back Burner? Prospects for Change" December 9, 2010 - Professor Michael Vandenbergh joins a moderated panel of three Vanderbilt experts discussing what we can do next, now that a down economy has shifted public focus away from the issue of global warming. 'Crop mobs' push Americans closer to food they eat - October 14, 2010 - Voice of America - In the 1930s, it took one farmer to feed every 10 Americans. Now the ratio is ten times that, and few Americans have strong ties to the food they eat or to the farmers who produce it. But a movement called Community Supported Agriculture is trying to change that, and social media plays a central role. James Fraser, associate professor of human and organizational development, is quoted. Lean and green couple's lifestyle shows how individuals can improve environment - October 4, 2010 - KentuckianaGreen.com - Although big industry has for years been the target for environmental degredation, a Louisville couple prove that it is possible to live sustainably in a modern world. Michael Vandenbergh, the Tarkington Chair in Teaching Excellence and director of the Environmental Law Program, is quoted. Saturday University at Vanderbilt to focus on energy and the environment - Issues including Climategate, the future of electric cars and floodplain policy will be examined during the fall 2010 Saturday University lecture series at Vanderbilt University, which brings the expertise of the Vanderbilt faculty to the Nashville community. Each lecture will include a question and answer session. To register for an event click here . Nov. 6: “Electric Vehicles: Are We Going Back to the Future?” by Jack Barkenbus, associate director of the Climate Change Research Network, affiliated with the Vanderbilt Institute for Energy and Environment. Nov. 20: “Implementing Effective Floodplain Policies in the United States” by Jim Fraser, associate professor of human and organizational development. European Tropical Forest Research Network (ETFRN) - September 23, 2010 - Michael Vandenbergh, the Tarkington Chair in Teaching Excellence and director of the Environmental Law Program, coauthored this article, which was featured in the September issue of the ETFRN newsletter. "Climate Change Isn't Coming to Nashville � It's Already Here. And the Future Might be Hotter Than We Can Handle" - Nashville Scene . Jonathan Gilligan , Associate Professor of Earth and Environmental Sciences, is quoted and wrote a related commentary explaining the science behind those conclusions: " What Climate Models Can Tell Us About the Future (and What They Can't)." "Study Led by Kip Viscusi Suggests Recycling Laws Work"